As a market-leader Daikin again shows the way with the launch of yet another world-class cassette that delivers superior design with high performance and low energy consumption, providing the ideal solution for offices, banks and retailers. 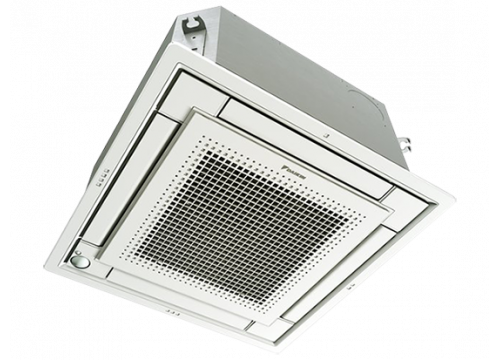 The fully flat cassette integrates the latest technology with energy saving functions that enhance user comfort, all within a unique design that allows the visible panel to fit flush within standard architectural ceiling panels. The fully flat cassette is the first cassette that fits fully flat with the ceiling, making the unit blend discreetly in the ceiling.The fully flat cassette fits flush in standard European architectural ceiling tiles. The newly designed panel integrates fully within one ceiling tile enabling lights, speakers and sprinklers to be installed in the adjoining ceiling tiles. Silent comfort The fully flat cassette is the quietest unit in the light commercial market and, in addition to the sensors, has various functions that are designed to enhance the user’s comfort and pleasure. The quality of the air in the room is as important as the temperature and we have fitted advanced filters to remove dust particles to ensure the air is clean. In addition, a special programme allows the humidity levels to be reduced without variations in temperature. The fully flat cassette’s advanced controller provides the user with absolute control over their work environment. The large display screen and on-screen instructions combined with clearly marked function buttons allow users to quickly set their desired conditions and to focus on the job at hand.